We have featured several smart collars/GPS pet trackers to date, and the Tractive GPS tracker has some unique features that we think really makes it stand out from the pack. For starters, it’s not just a dog gps tracker. It’s marketed towards both dogs and cats alike, which is great for cat owners since many of these pet trackers are exclusively for dogs. The Tractive pet tracker is also one of the most affordable tracking devices for dogs and cats, while also bringing features to the table that others gps pet trackers don’t have. A big plus for the Tractive is that it works outside of the United States, unlike some of the other GPS trackers for dogs that only work in America. But it’s not a perfect device, so let’s go over the features, what sets Tractive apart from the rest, the benefits of using it, and some of the areas where they could improve. By then, you’ll have a good understanding of what this device is all about, and whether it’s a good fit for your lifestyle and your pets, or whether you might want to consider one of the other pet tracker options. We’ll compare the Tractive to these in a few moments, but if you want to read a more indepth review, here you go..
Tractive allows you to open up an app on your phone and see your pets exact location on a map. When you’re in live tracking mode, there’s only a delay of a couple of seconds, so if you’re trying to find your pup when they’re missing, you can see where they are in just about real time which makes it a LOT easier than trying to track them down when there’s a longer delay. The Tractive is made very strong, with a simple and minimalist design. They say it’s “almost unbreakable”, because of course somebody is going to find a way to destroy it, but when it comes to daily use with your pet, it’s hard to imagine it breaking. It doesn’t just track your pets in real time, though. You can also take a historical look at everywhere they have been within a designated time frame. If you think your pet might be getting into mischief when you’re not around, but you want to know for sure without having to stare at the app all day, now you can find out easily with Tractive’s historical log. We compare the Link AKC and Whistle 3 when it comes to wearable devices for your pets. There are some BIG differences between them, most of which land in favor of the Tractive. One noticeable feature that’s lacking from the Tractive is the ability to track your dog’s activity. The Link AKC and the Whistle 3 can both work kind of like a Fitbit for your dog, and they have smart AI technology to help you understand the data that they collect in regards to your dog’s physical activity, movements, and exercise. If you’re interested in having that data, you’ll want to consider one of those two options, but if you don’t really care about that and you’re only looking to track your dog’s (and cat’s) location on the map, then the Tractive would be the most affordable and solid option to go with. Tractive also comes out on top for people who travel a lot, or don’t live in the United States, since it works all around the world (In many different countries, but not all of them…) With the other options, you’re limited to the United States. How Does The Tractive GPS Tracker Subscription Work? You might be wondering if you need a subscription or if you can use the Tractive dog tracker without one. Yes, you do need a subscription, but it’s quite affordable… In fact, Tractive offers one of the more attractive subscription plans that we’ve seen to date in terms of features and also being less expensive. You get more for less, plus the device itself is one of the less expensive ones in the first place. Needless to say, Tractive is bringing a ton of value to the table in order to tempt pet owners to give them a try. In the long run, it makes sense for them to give away their devices for a bit cheaper if it means somebody is going to subscribe for years to come. Tractive offers two levels of subscriptions. The more expensive option is about the same price as any of the competitor’s we’ve seen, but they also have a “Basic” plan for people who want to spend less. The basic plan comes with GPS tracking at 2-60 minute intervals along with live tracking with 2-3 second intervals. The “Premium” subscription comes with the same tracking options, but also includes worldwide coverage so it’ll work no matter where you are – even if you’re on a trip somewhere with your pet and you’re not familiar with the area – you can track them anywhere. You can view a history of every location your pet has visited which you can even export, you can share access to other users, and you get a higher tier of customer service if you ever need help. You’ll need to own a tracker before you can subscribe. Once you own it, the box will give you full instructions on setting it up, but it’s a very easy process to activate it and have it working right out of the box, quickly, so you can protect your pet ASAP. It’s pretty simple. If you want to track exercise, the Tractive pet tracker isn’t the right choice. If you want to pay less and only track your dog’s location, then the Tractive is perfect. It’s durable, easy to setup and use, and the subscription is the cheapest we’ve seen compared to other leading pet tracker brands. It works internationally, and has the ability to look at historical locations as well. 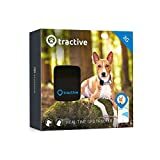 All in all, the Tractive is a great pet tracker for anyone who is looking for something affordable, simple, without a bunch of extra frills. Keep it mind that while the Tractive works in many more countries than the Link AKC and the Whistle 3, there are still some countries where it won’t work. You can check compatibility on the Tractive website.